This page provides an overview of the Council’s key priorities and gives further context to the strategic framework within which social value is delivered. We are Croydon – The Council and its partners have a vision, developed in consultation with over 20,000 residents and businesses, that by 2040 Croydon will be London’s most enterprising borough that fosters ideas, innovation and learning and provides skills, opportunity and a sense of belonging to all. The Community Strategy is the overarching strategy for the borough. It sets our overall strategic direction, the priorities and outcomes we will focus on, and provides the framework for delivery that will guide and direct the activity of Local Strategic Partnership boards. Croydon’s Corporate Plan for 2018-22, reflects the administration’s Manifesto committments. It sets out the Council’s priorities and looks at the need for change in our service delivery to take a more preventative approach; improving outcomes for our residents, businesses and communities. The Croydon Observatory provides access to data and information about Croydon. It is an information sharing, mapping and reporting website that can be used by anyone. Opportunity and Fairness Commission was launched in January 2015 to identify existing assets, understand the local challenges and communities’ concerns and priorities, and propose solutions and engage with those who can deliver them to create a fairer and better place to live for everyone. Council’s Equality Policy 2016-20 sets out the Council’s approach to fulfilling its statutory equality duty as a Public Sector employer under s149 of the Equality Act 2010. The Council’s equality objectives are set out in our Opportunity and Fairness Plan which outlines the key areas of focus for the council and its partners from public, community, faith, voluntary and business sectors. In 2017 the Small Business Commission investigated and recommended actions to boost the growth and success of local small and medium-sized enterprises (SMEs). The Commissioning Framework sets out the Council’s commissioning principles and our approach to ensuring the services we deliver (either in house or by working with our suppliers) meet local needs and deliver value for money. Below is a list of the key programmes, campaigns and initiatives supported by Croydon Council. The purpose of those programmes is to support the wider strategic vision of the Council. The Council wants its partners to be aware of those priorities and where appropriate evidence active support for those through their (and their supply chain) delivery of social value. They also enable the Council to work with its partners in the public, community, voluntary and business sectors to deliver the highest standard of equalities and inclusion practices and secure better outcomes for local people. Croydon Means Business 2018, the inaugural Croydon Year for Business aims to showcase Croydon as a great place to grow a business and to inspire further innovation among the borough’s business community. Croydon became the first London borough to win Social Enterprise Place Status in 2014. Social Enterprise Place status recognises the number of businesses in Croydon that reinvest their profits in making a difference by tackling social issues such as improving communities and the environment. It also recognises Croydon Council’s determination to grow the social enterprise community. Good Employer Charter is a local accreditation scheme aimed at businesses that operate in the borough and want to become part of the Croydon Good Employer Network, gaining recognition as good employers and responsible businesses. Croydon Works is a job brokerage service, delivered by a partnership between Croydon Council, Croydon College and Job Centre Plus, to provide employability support and a free to use recruitment service for the residents and businesses of Croydon. More young people live in Croydon than anywhere else in London. Young people are clearly the future of the borough and each one has the potential to make Croydon an even better place to be. They are also part of the solution to youth violence. ‘Choose your future’ promotes and celebrates the positive choices available to Croydon’s young people. The campaign works with businesses and organisations operating locally to offer volunteering, career mentoring, apprenticeships, paid work to young people in Croydon. The council is a London Living Wage employer and encourages all Croydon employers, big or small, to become London Living Wage employers. The Living Wage is an hourly rate of pay, which is calculated according to the cost of living. Croydon is working towards being a dementia friendly borough. The Croydon Dementia Action Alliance is a group of local businesses and other organisations like the council, shops, fire brigade, police, who commit to making their organisation dementia friendly and supporting the wider work to continue making Croydon a good place for people living with dementia and their carers. These commitments embrace the three pillars of a dementia friendly community – people – making everyone a dementia friend, place and process. Dementia friends awareness sessions Dementia Friends is about learning more about dementia and the small ways you can help. The actions don’t have to be big, it could be as simple as being patient if someone ahead of you in the supermarket is struggling or a big as ensuring a new building is dementia friendly. Dementia Friends session lasts around 45 mins. You will learn more about dementia and how you can help to create dementia friendly communities. And, at each DF session there’s bingo and a prize – who could ask for more! There’s no charge, we only need people and a room. Croydon Council is a Disability Confident Employer and encourages its partners and wider businesses operating in the borough, to support this government scheme which aims to help employers make the most of the opportunities provided by employing disabled people. The Disability Confident Action Group (DCAG) is a forum for local groups and national organisations based in Croydon that helps support disabled people and those with long term health conditions to fulfil their potential and realise their employment aspirations. The DCAG, facilitated by Croydon Council, meets bi monthly and has a membership of some twenty plus Croydon based organisations including Croydon People First, Ingeus, Shaw Trust, Status Employment, Mind in Croydon, Jobcentre Plus (Department for Work and Pensions) Startup Croydon, and London Economic Development Company. Aligned to the National Disability Confidant Campaign the DCAG aims to increase the awareness and confidence of employers in the borough to employ people with disabilities, challenge attitudes towards disability, and increase the understanding of disability. It meets to discuss legislation, current issues around disabilities, co-ordination of activities and the sharing of information. There are regular contributions from other bodies on work taking place to champion people with disabilities. Timewise is all about how flexible working can attract and nurture great talent. Timewise is driven by the social vision that people should be able to progress their careers whilst finding the flexibility they need to meet other commitments. Whilst most employers in the UK have a flexible working policy, the reality is that 14 million UK workers don’t have the flexibility they need, especially when looking to progress in their careers or return from a career break. Consequently, employers are missing out on the full benefits of flexibility to drive business performance, build inclusive workplaces and access the best possible talent. Croydon LIVE is a platform for Croydon’s communities to develop, fund and launch their own projects. Visit the website to see current projects. The SUGAR SMART Croydon campaign aims to raise awareness of levels of sugar in the diet and its health implications, and to reduce sugar consumption across all age groups and communities across the borough. In Croydon, around 1 in 5 children entering reception are overweight or obese, rising to well over 1 in 3 by the time they enter secondary school; and 1 in 4 five-year olds have one or more decayed, missing, or filled teeth. A key objective of the campaign is to improve the “food environment” of the borough, making it easier for people living and working in Croydon to make healthy food choices. In order to achieve this, SUGAR SMART encourages organisations, including businesses and workplaces, to sign up to the campaign and make simple, feasible pledges to reduce the amount of sugar in the food or drinks they offer and promote to their clients and workforce. Live Well Croydon is a holistic behaviour change and integrated lifestyle programme which aims to make it easier for residents to look after both their physical and mental wellbeing. This service aims to support people to make healthy behaviour changes, such as quitting smoking, losing weight, being more physically active and promoting positive mental health. The service is integral to the support Croydon Council and its partners provide to enable people to lead healthy and happy lives and advocate a healthy culture across the borough. There is a single point of access via the website: https://www.justbecroydon.org/ and a free on-line health MOT. Organisations are encouraged to promote Live Well and the Health MOT across their workforce and the communities they work with. Making Every Contact Count (MECC) is an approach to behaviour change promoting the opportunistic delivery of consistent and concise healthy lifestyle information and enables individuals to engage in conversations about their health and support them in making positive changes to their physical and mental health and wellbeing. The fundamental idea underpinning the MECC approach is simple: it recognises that staff across health, local authority, business and voluntary sectors, have thousands of contacts every day with individuals and are ideally placed to promote health and healthy lifestyles. Staff across a variety of organisations can make a difference to the health and wellbeing of the Croydon population to change behaviours that may be having a negative impact on their lifestyle through brief healthy conversations. We encourage organisations to adopt a MECC approach by embedding the free brief e-learning training into your Learning & Management System – if you provide eLearning to staff – and incorporating it into wider service plans. Formed to promote the mantra “Safeguarding Is Everybody’s Responsibility” the Triple C Partnership combines the skills and training resources of the London Borough of Croydon and its Safeguarding Boards with the business links and networking opportunities of Crystal Palace Football Club, to encourage everyone in the borough to consider Safeguarding as an important tool to combat child abuse and promote the best opportunities for all children. Employers operating in the borough are encouraged to visit the website to find out about opportunities to get involved and learn how they can support their staff to take up these really important free training opportunities. The White Ribbon campaign has been created by a group of men who know that there’s never an excuse for violence against women. They pledge never to condone it, or to stand by when they know it is happening. The Council is a keen supporter of the White Ribbon charity. Go On Croydon is a project that ran in 2016 and aimed to boost basic digital skills in Croydon. Improving digital skills of our residents is an important priority for the council. At present a significant number of residents who can’t, or don’t want to, use the internet are at a significant risk of being left behind as technology advances and becomes more integral to daily life. 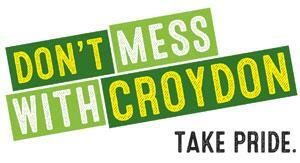 The Don’t Mess with Croydon campaign seeks to crack down on fly-tipping and other environmental crimes in the borough. It sends a firm message to anyone who blights our borough with litter. Issues such as fly-tipping have a negative effect on people’s quality of life. Those who dump rubbish in our streets affect everyone in the community. Take pride: it’s our duty to look after the environment and dispose of our waste responsibly; there are a range of services available to help to keep communities clean and tidy. With support we can make Croydon one of the cleanest greenest boroughs in London.